Global Warming is due to the absorption of an additional heating power coming from the sun. For an increase of 0.5 [K], the additional power is currently 60 times greater than what we consume. For the announced temperature increase of at least 2 [K], the ratio amounts to 250. The planet must increase in temperature to be able to evacuate this considerably large surplus of energy. The recorded Global Warming would be too large to be explained only by a variation in solar activity. The absorption coefficient of the atmosphere would therefore have increased. This scenario would be the most appalling because the power reserve from the sun is unparalleled with what we can and what we will ever be able to produce. The activity of the sun and the absorption coefficient of the planet did not vary. The “thermal resistance” of the atmosphere increased and the heating relates to the surplus of power due to human activity. 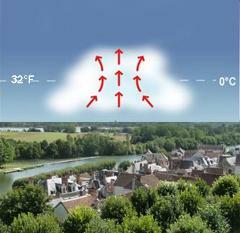 The “surface” must increase in temperature to evacuate its energy ‘through” this increasing resistance. The current increase of 0.5 [K], would currently be 60 times greater than what it should be. For 1 [kWh] consumed, the observed temperature increase would correspond to 60 [kWh]. 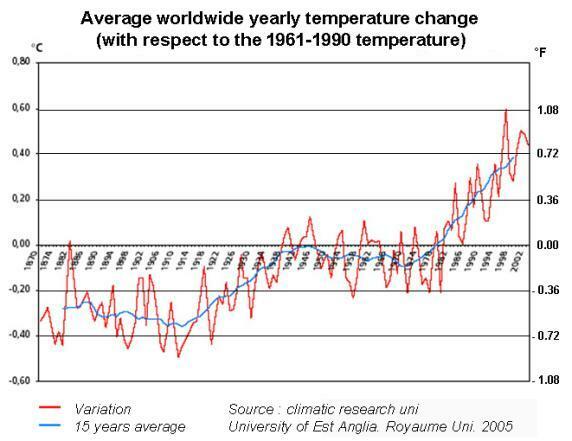 For the announced temperature increase of at least 2 [K], over the next 80 years, the ratio will be 250. The increase in temperature at the surface level leads to an increase of the evaporation of the oceans, and consequently to an increase in the intensity of precipitations. The energy liberated by condensation of water vapour and the increase in the temperature difference between the surface of the earth and the outer layers of the atmosphere increase the concentration of energy in the inner layers of the atmosphere in the form of convective movements (storms). Given the current state of knowledge, it seems that at the very least we share with the sun the responsibility of the ongoing process. It is less likely that our “small activity” has resulted in the extinction of most of the other large and wild mammals from the surface of the earth. Some caution on our side would therefore call for a rapid alteration of our behaviours and of our energy production-utilization mode.